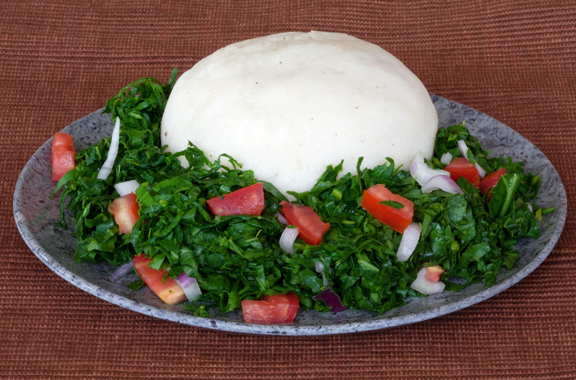 Ugali is a staple food of Kenya. It is prepared from maize (corn) flour and is commonly eaten with traditional vegetables such as sukuma wiki (kales), terere (amaranth), spinach or managu (African nightshade). It is known by different names amongst the various communities of Kenya such as Kuon among the Dholuo, Ngima among the Kikuyu, Sima among coastal communities and Obusuma among some Luhya sub-tribes. Heat the water to boiling point in a saucepan. Once the water is boiling, pour in the maize flour slowly while stirring with a wooden cooking stick. Your cue to stop adding flour is as soon as you achieve a thick sticky mix. Reduce the heat to simmer and mix thoroughly until a steady sticky consistency. Cover the saucepan and allow to simmer for five minutes. Turn the contents again and shape into a round 'hill like' shape. Allow five more minutes with the saucepan open to eliminate excess water. To check if the ugali is ready, do it the traditional way that Kenyans do it. Take a small piece with your hand and roll it into a ball. Throw it hard against the kitchen wall, if it sticks it to the wall then you need to cook for a few more minutes; if it falls off the wall, then your ugali is ready! Wet the wooden stick with cold water from the tap and shape the ugali again before removing from the saucepan. Wetting the stick prevents it from sticking to the cooked ugali. Take a clean kitchen cloth and hold it one hand. Using your other hand, turn the saucepan upside down so that the ugali drops off and onto the kitchen cloth. Quickly turn it around to prevent injury and place the mound on a plate. Serve with cooked green vegetables, meat or chicken. Too much water and you end with porridge, too little and your ugali ends up too hard; you need to achieve the perfect balance. This is usually a process of trial and error; after going at it a few times you will get it right. You must cook the ugali for at least ten minutes otherwise the flour will be undercooked. Cooking it slightly longer actually improves the taste.